Thanks to Rosie Murray for this great blog describing how she used a collaborative Talking Mats ‘Wall’ to help students comment on how different activities inside and outside college make them feel. As a student, I trained in the Talking Mats approach, after finding it incredibly useful in clinical placements. I am now a speech and language therapist at St John’s College in Brighton. This is a college for young adults with autism, learning disabilities and SEBD. Our learners have a wide range of communicative needs and cognitive abilities. I was approached by our nursing team in the lead up to world mental health awareness day, as they were organising a ‘tea and talk’ session for our learners of all abilities. We organised a range of activities, such as symbolised conversation starters. However, we felt we needed something to allow our less verbal learners to make their voices heard. I thought back to my training, and remembered Joan Murphy talking about large, collaborative Talking Mats – or ‘talking walls’. We discussed this idea, and felt it would be a great way for students to feedback on how different activities inside and outside college make them feel. It took some considerable planning. Due to the emotional needs of some students, our top scale required us to avoid words that were too upsetting for individuals. In the end we settled on ‘good’ (with a widget ‘calm’ symbol) and ‘worried’. We also wanted it to provide a genuine opinion, so although we considered including activity options that were clearly negative, e.g. ‘fire alarms’, we took the opportunity to show our learners that we all have different opinions on things, and that this is good. We hypothesised that because of this, learners would be skewed towards giving positive opinions, and this informed the order of presentation of the top scale and the activities themselves. On the day, we had 15 different activities to give an opinion on, each with different border colours for differentiation, and of course blank tiles so our learner’s could come with their own activities. Students were encouraged to write their name on the back of a chosen activity, and a consistent script was used to present the wall to each learner. 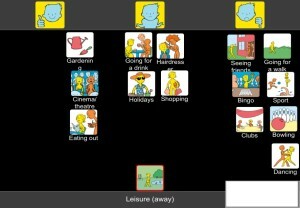 Makaton signing was used alongside the script to support understanding. Learners of all abilities offered their opinion, and it generated discussion between learners of differing abilities. 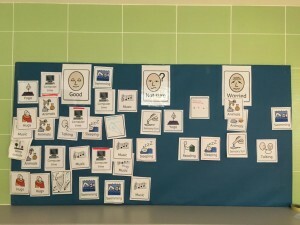 It signposted staff to particular likes and dislikes of learners, and showcased the power of talking mats to all staff. For example, one of our learners is a cheerful young man, who uses minimal verbal utterances to communicate. When the board was presented to him, he very clearly selected ‘talking’ as an activity, and clearly indicated that it makes him worried. This has allowed us to reflect as a staff team about how we can support him to communicate with minimal anxiety. 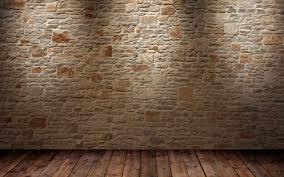 Learners too took away some important lessons from using the wall. They saw that while some activities are VERY popular (e.g. computer time), some are quite polarised, e.g. animals. This highlights the important issue of mutually respecting each others differences. 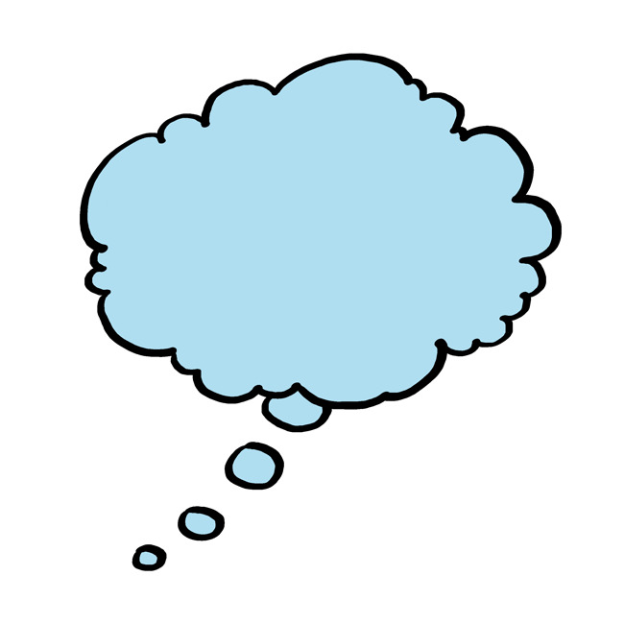 Since the event, staff have discussed ideas they have on how to utilise this tool. We are considering how we could use Talking Mats as a tool in our peer mentoring sessions between learners of higher and lower verbal ability, as we feel it would be beneficial for both mentee and mentor. We are looking forward to using Talking Mats as a flexible tool for the college in the future. Please let us know of any other innovative ways of using Talking Mats! 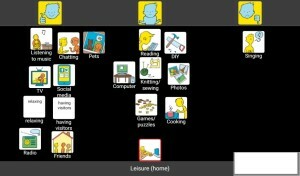 This entry was posted in Blog, Children and young people, Communication difficulties, Learning disability, Participation, person centred approach, Self management and tagged Communication difficulties, Learning Disability, Participation, Personalisation, Talking Mats on October 20, 2017 by Joan Murphy. 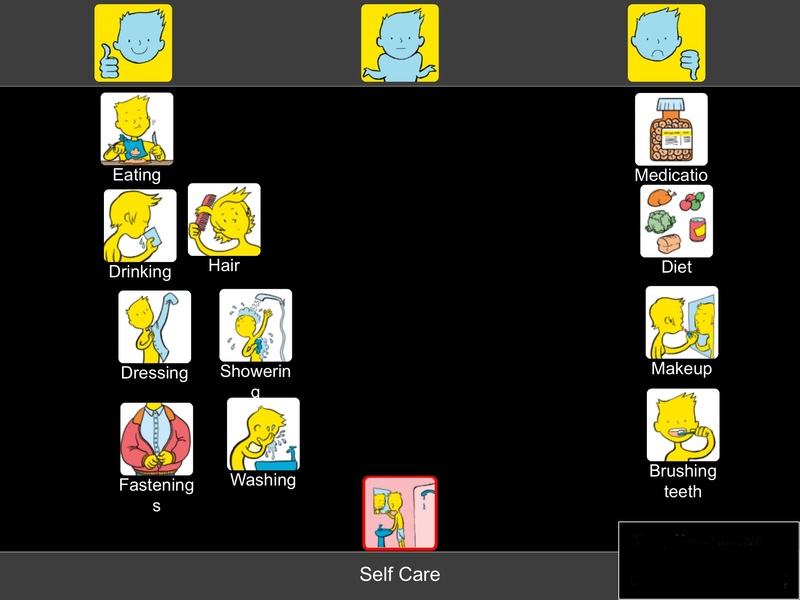 We are now half way through our project, funded by The Health and Social Care ALLIANCE Scotland, whose overall aim is to empower people with a range of long term conditions, with and without additional communication difficulties, to self-manage their own health and well-being by using Digital Talking Mats. We have carried out all the initial visits and 16 follow-up visits and participants are sending in their completed mats, choosing whichever topics they want from the digital Health and Well-being resource. At the time of writing this blog we have received 137 completed mats. 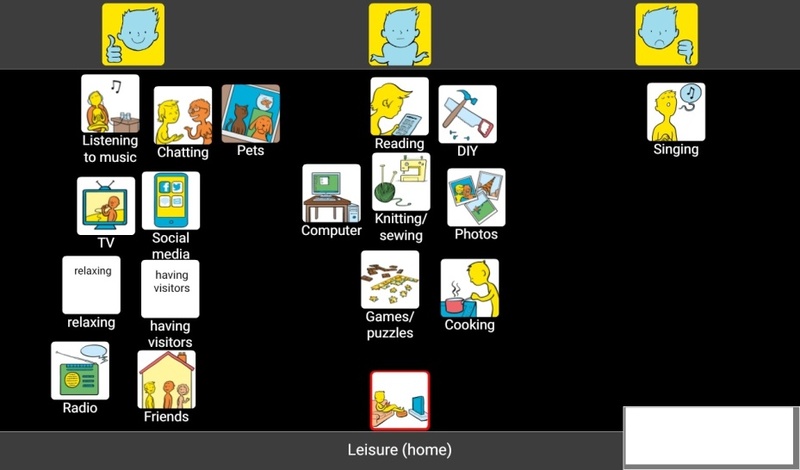 We have received very positive feedback with many examples of how people are using the Digital Talking Mats to self-manage. One participant with learning disability has diabetes. Through using the Digital Talking Mats she has stopped buying takeaways every night and is now buying M&S ‘Balanced for You’ meals. This is a huge step forward for her as she refused to discuss healthier eating before. A man with early onset dementia has identified that he used to enjoy singing and has decided for the first time in his life to join a choir. This is not something that had come up in conversation before. Despite the diagnosis of dementia he has realised that he is still keen to try new things. 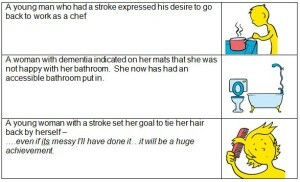 The wife of a man with severe aphasia said ‘This (Leisure away) has highlighted how few things he can do away from home. We discussed this but can’t see how we can change the situation.’ However at the second visit he used the same mat and indicated that he had been thinking about his mobility and was about to start swimming and a fitness class. 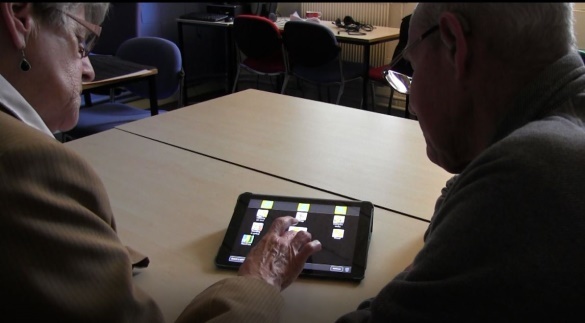 We already have an increased awareness of the meaning of self-management as we observe how participants are using the Digital Talking Mats to think about their situation, state their own views and share them with carers/support workers. We are also noticing that there is a shift in some relationships as the carers/support workers realise that the person with the long term conditions can make decisions and express their own views rather than having decisions made for them. This entry was posted in Aphasia, Blog, Communication difficulties, Dementia, Digital Talking Mats, Learning disability, Participation, Self management and tagged Aphasia, App, Communication difficulties, Dementia, Learning Disability, Participation, Research, Talking Mats on May 19, 2017 by Joan Murphy.